Sonja has been nominated as Vet of the Year in the 2016 and 2017 Pet Plan Veterinary Awards. She is a senior vet at Barton Lodge after first joining us back in April 2009 as a locum. Sonja qualified in 1998 at the University of Pretoria in South Africa. 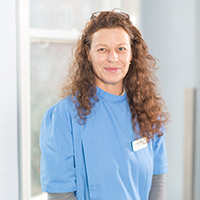 She is highly experienced and previously worked in a number of veterinary practices both in the UK and abroad. Clients who have met Sonja know that she is a compassionate person and an excellent, dedicated vet.